This is an advertisement for En Avant Yeast. Yeast was a very important ingredient in the 19th century and was used by many in many different food processes, for example it was the fermenting agent used to make beer and was used by bakers to make the dough rise in their bread. 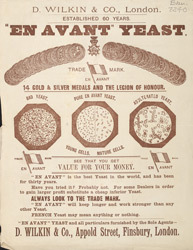 This leaflet is highlighting the high quality of the particular yeast and draws attention to the medals that it had been awarded. Interestingly it mentions the Legion of Honour which is a French medal awarded to men who performed great acts of bravery on the battlefield or who served France in an exemplary way. One must assume that this is exemplary yeast.